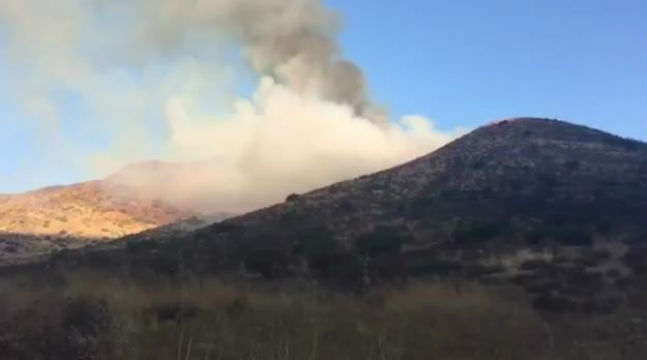 A fire of unknown origin that charred about 25 acres as it spread over hilly terrain just north of the U.S.-Mexico border in eastern San Diego County was 75 percent contained Friday morning, authorities said. No structures were damaged or injuries sustained in the blaze that erupted a little after 3 p.m. Thursday about a mile west of the Tecate Port of Entry in the Potrero area, according to Cal Fire. Ground crews and personnel aboard firefighting aircraft fought the flames, halting their spread within two hours, the state agency reported. The fire was 20 percent contained as of 7:45 p.m. Thursday, Cal Fire reported. Fire crews working through the night had it 75 percent contained as of about 6 a.m. Friday. The blaze was never an imminent threat to any of the back-country homes or other structures in the area, Cal Fire Capt. Issac Sanchez said. Its cause was under investigation.